The unforgettable story a group of working class boys from the wrong side of the tracks, Jersey Boys. WINNER of 55 major awards worldwide, including the Olivier Award for BEST NEW MUSICAL. Discover how four New Jersey boys from the wrong side of the tracks invented their own unique sound, were inducted into the Rock & Roll Hall of Fame and sold 100 million records worldwide. With spectacular performances of all their hits, JERSEY BOYS is the electrifying true life story of Frankie Valli and the Four Seasons; the mob, the heartaches, the triumphs and the music. This sensational production features many of the bands worldwide hits, including: BEGGIN', CAN'T TAKE MY EYES OFF YOU, OH WHAT A NIGHT, WALK LIKE A MAN, BYE BYE BABY (BABY GOODBYE), SHERRY, BIG GIRLS DON'T CRY and many more. 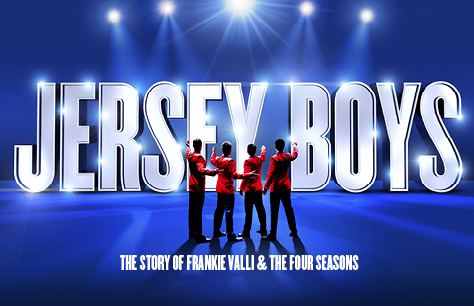 JERSEY BOYS has now been seen by over 4 million people worldwide! 2h 30 minutes incl. interval. Recommended for 12+ due to strong language. Children under 5 years and babes in arms will strictly not be admitted. Brilliant show, the energy and talented vocals exhibited by the cast were inspiring, a thoughly enjoyable experience that we hope to repeat soon.